Campaigners have vowed to battle plans to close three banks in the Moray region. Keith will be losing two of its three branches with the TSB and Bank of Scotland moving out and Lossiemouth will be left with no permanent bank. Now campaigners in both towns have claimed that they will not give up trying to attract other UK financial institutions to the area. Mike Mulholland, chairman of Lossiemouth Community Council, insisted they will continue efforts to convince other businesses to come to the towns. He said: “We are waiting for replies to our letters we sent out to banks and are currently talking to one national bank where we will try and persuade them to come up and see what we can offer. Linda Gorn, chairwoman of business association United Keith, believes campaigners need to set their aims high in order to achieve success. She said: “We can certainly fight this but it needs to be taken higher as there is not point talking to the man in the street. TSB has revealed that its branch in Keith will be closed in the coming months, and the opening hours at one of its sites in Forres will also be reduced. The announcement comes on the back of the news last year that the Bank of Scotland was shutting down in Lossiemouth and Keith. A TSB spokesman said that as part of its recent review banking bosses had taken the “very difficult decision” to close its branch in Keith. He said: “Customers are changing the way they interact with us and over the past few years we have seen the usage of the branch continue to fall. “Three out of every four TSB customers in Keith now use online, mobile or telephone banking to access TSB banking services and around 60% of our customers actually regularly use other TSB branches. 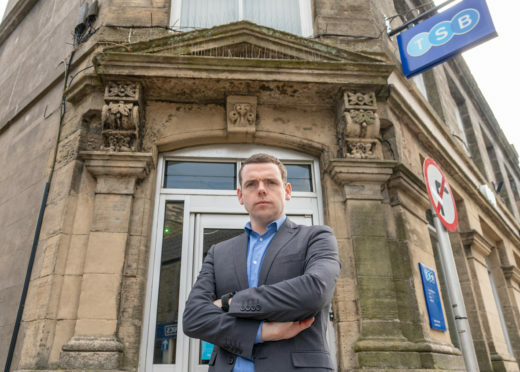 Moray MP Douglas Ross condemned the actions of TSB highlighting that the closure would have a detrimental effect on Keith residents who cannot access the internet to do online banking. He said: “They should have a moral obligation to provide services in local communities.